Perched at one tip of Williamsburg, Brooklyn, Nori Komuro's home sits hidden among industry. I've come to expect something unexpected when visiting Komuro. There's always some adventure, some surprise, some unknown element involved in the getting there. After a series of excited phone calls from Komuro about his new VT-52 amplifier -- "it will make you crazy" -- we managed to pull together a small listening session within a remarkably swift few short weeks. The plan was for me to bring my Altec Valencias which amazingly managed to fit in my hatchback, saving me a few thousand dollars in fuel costs over the family SUV option. I also brought along my trusty Shindo Labs Monbrison which provided one point of component continuity from our last listening session with Komuro's 212e amplifiers. The rest of the setup consisted of a Sony DVD player and various cables (more on these below). Among those who also listened were John DeVore of DeVore Fidelity, Stephen Mejias from Stereophile, Don Garber of Fi, Fumio Ito of Quest America, the US Importer for Nanotech Systems, and a few other friends of Komuro. The evening was very relaxed, comfortable and completely free from any audiophile noodling. The Valencias were put in place in minutes, cables connected, some beers were opened and listening commenced. While I've had the pleasure of meeting Don Garber before, this was the first time I got to see Don and Komuro together. "Is that the circuit you drew for me a while ago?" Don asked Komuro. Komuro eventually answered. "Yes." Without the benefit of inflection, pause and expression, you won't get the subtle meanings conveyed in this deceptively simple exchange nor understand why most of us laughed. I got the distinct impression that nearly everything Don said to Komuro and Komuro said to Don had layers of subtexts and pregnant meaning. This made me wonder, yet again, what it must have been like with Don, Komuro, JC Morrison and Herb Reichert working in such close quarters at the store that was Fi at 30 Watts Street. It's hard to picture these big personalities fitting into one small place at one time. Some quantum level laws were surely broken. It may come as a surprise to people who've followed Komuro's work over the years that he's now made a low-powered stereo amplifier. 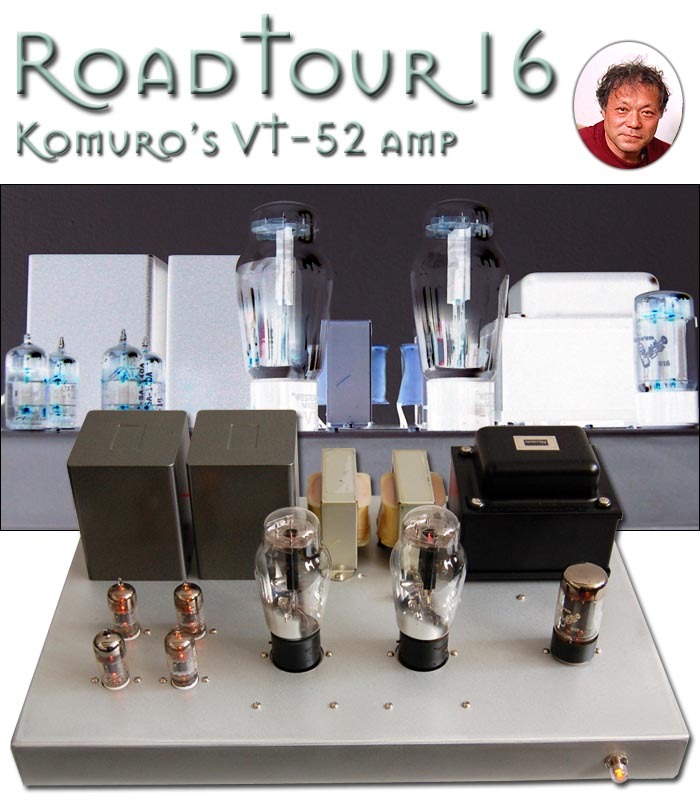 Komuro is probably best known for his high-powered triode amplifiers utilizing 845s and the monster Western Electric 212e. Like dreams, expectations are meant to be broken. 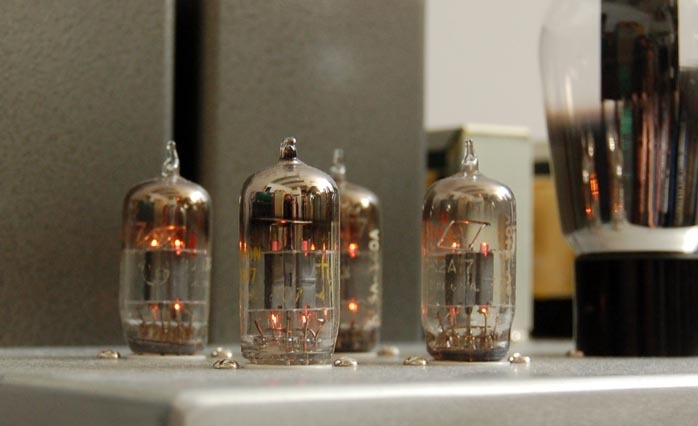 We are looking at and listened to a prototype single-ended triode, direct-coupled, hand-wired stereo amplifier using a pair of 12AT7 dual triodes for each channel of the driver stage fronting NOS Western Electric VT-52 power tubes. Tube rectification is via Amperex Bugle Boy 5AR4. This prototype version uses a Hasimoto power transformer and a pair of Tango output transformers but the final production version will employ custom-wound transformers from AudioSpice which Komuro believes offer more bandwidth over the Tangos, especially in terms of improved bass. Output power is estimated at about 3 watts. Final pricing has not been nailed down but figure in the $6500 to $7000 range. Prospective buyers should also realize these are made to order. The making takes time. Instant gratification junkies, point and click purchasers, tire kickers, AudiogoN addicts and swingin' gear swappers need not apply. Mr. Fumio Ito is the US distributor for AudioSpice, Nanotec Systems and a friend of Komuro. 6moons readers will have read about Nanotec cables from reports by Marja and Henk. Without delving too deeply into reviewer ville, I can say that the Nanotec Systems G.S. #79 speaker cables were very easy to listen to and added body and a welcome plumpness to the overall presentation. We were using zip cord prior to the switch so relative performance and value considerations are getting into comparing apples and caviar territory despite the Nanotech cables' relatively reasonable price.